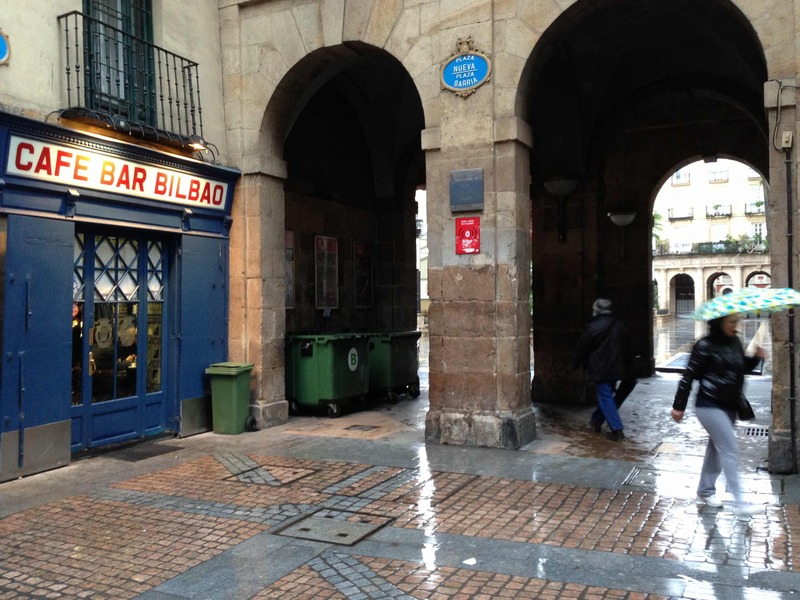 I visited Bilbao twice in the last year as part of my work on the CIVITAS program. On my first visit I walked all over the city and discovered the Plaza Nueva in the historic city center. I fell in love with the space and decided that I’d make a point of returning. Plaza Nueva Bilbao in September 2012. My first trip was in September and so the city was green and warm (photo above). My second trip was at the beginning of February … gray, cold and rainy, with a little bit of snow! 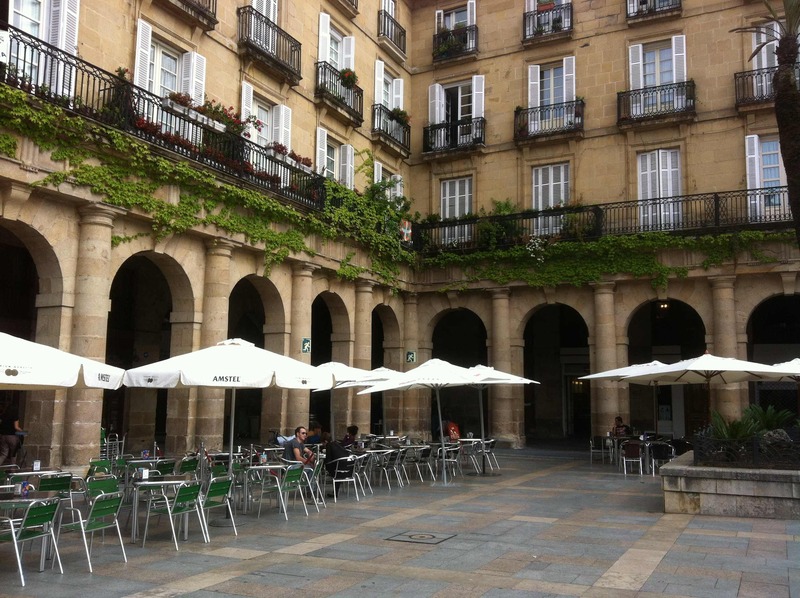 Would the Plaza Nueva be as appealing? Would the arcades be full of people enjoying a glass of wine? Amazingly, yes! And, that’s what really convinced me this was an extraordinary space. The square is large, but not too big to be overwhelming. It’s surrounded by arcades, there’s no vehicle traffic. 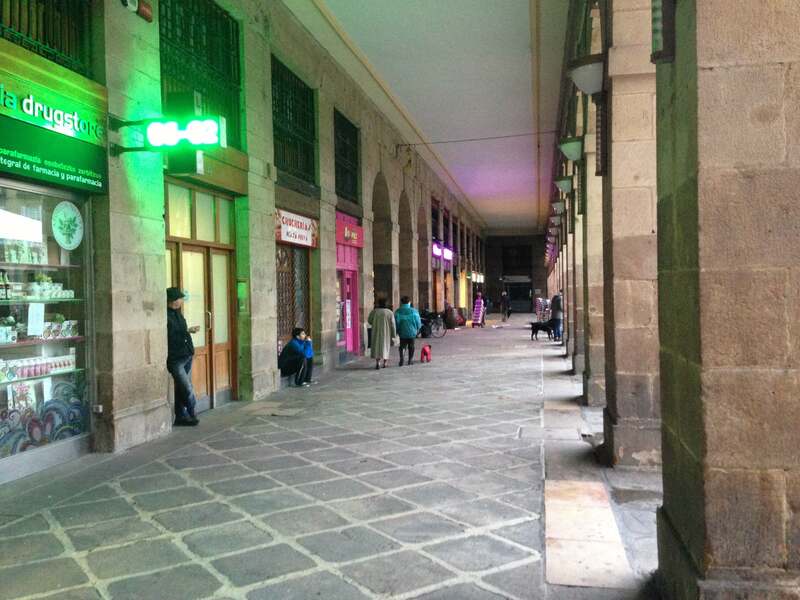 The arcades are about 4-meters wide and lined with a variety of shops and restaurants. Unlike many historic European squares the shops and restaurants seem to be oriented towards serving residents – sure there are tourists, but the majority of people seem local. On my February trip I feared the worst … it was raining too hard for me to go very far from my hotel and so I needed to cancel plans to meet a colleague staying in another part of the city. I was glad to have picked a hotel near the Plaza Nueva. I did get wet in the 3 minute walk, but not soaked. And, here’s why arcades are so good … people were outside under the arcades – dry! – talking, eating, drinking and generally just hanging out on this rainy winter night. Not as many as in the summer, but more than I expected. Tapas at Gure Toki in Plaza Nueva Bilbao, September 2012. I love tapas and Gure Toki’s tapas are great. After eating two or three tapas there, I went next door and had another, but returned to Gure Toki for my last tapas of the evening. Tapas eating is an adventure for me, lots of pointing and gesturing because I don’t speak Spanish, but people in Bilbao, and everywhere in Spain, are very friendly. 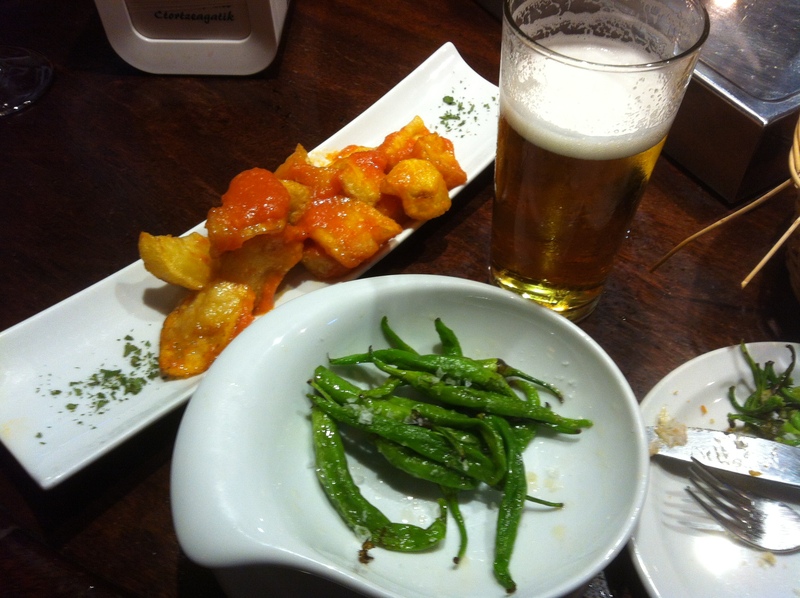 I love the tapas approach to eating … small plates, small glasses of beer and wine, move on to another cafe for a second, and another for a third, etc. The Plaza Nueva is a great place to do this because they have about ten different restaurants and cafes along the arcade. 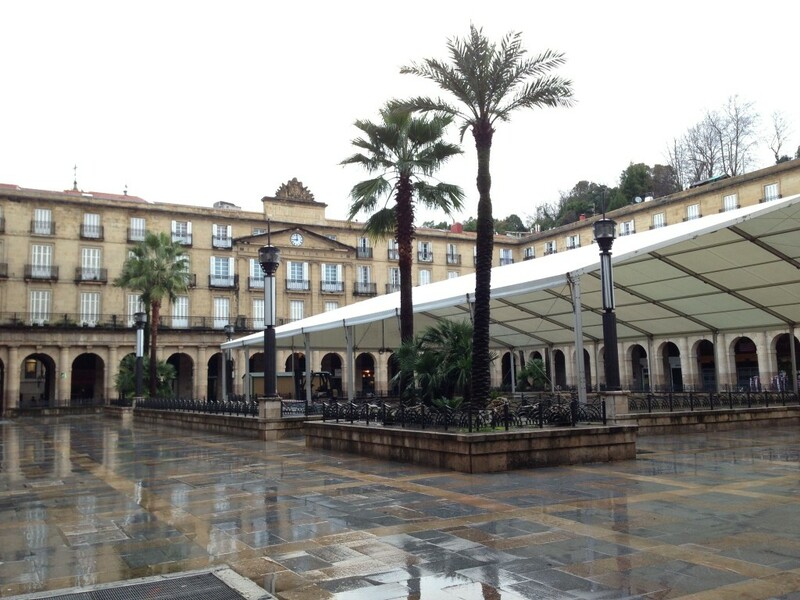 Looking into the Plaza Nueva in Bilbao, February 2013. The next morning I had my first coffee at the La Ribera Market, a nicely renovated market hall nearby, but then returned to the Plaza Nueva and had a second coffee and Iberian ham sandwich at the Cafe Bar Bilbao (see photo). The Cafe Bar is very beautiful inside with traditional tile work and decorations. The food looked great and I’ll be sure to stop here for a tapas next time I’m in Bilbao.